Winter is here but soon it will be time to put away the sweaters and air out the t-shirts, shorts, and flip-flops. Well, I guess that depends on where you live. But if the spring flowers havent caught up to you yet, never fear, they soon will. With that nice weather comes the opportunity for hanging outside with friends and family. Barbecue, swimming pool, entertaining, gossiping about that weird couple down the street; the possibilities are endless. To get ready for all this carefree frivolity, its time to plan to protect your investment by refinishing your backyard deck or your pool deck. Since the deck lives outdoors, its going to age and change appearance (graying) because of the suns ultraviolet rays (UV). The general effect here is the breakdown of the wooden surface fibers and lignin. For the curious  Lignin: A complex polymer, the chief non-carbohydrate constituent of wood, that binds to cellulose fibers and hardens and strengthens the cell walls of plants. OK! Any traffic on the deck surface will exacerbate this process. But although its a fact that the deck will age, refinishing is easy. It also gives you an excellent opportunity to change the look, in that you can change the stain color. There are two methods of preparing the deck surface depending on whether your goal is cleaning or refinishing. For a small deck, you might want to use a mixture of warm water and laundry detergent with a stiff brush on a broom. To keep the soapy mixture from leeching in, keep it rinsed off with a garden hose fitted with a high pressure sprayer. This is a good approach for an interim cleaning where a full refinish is not yet needed. 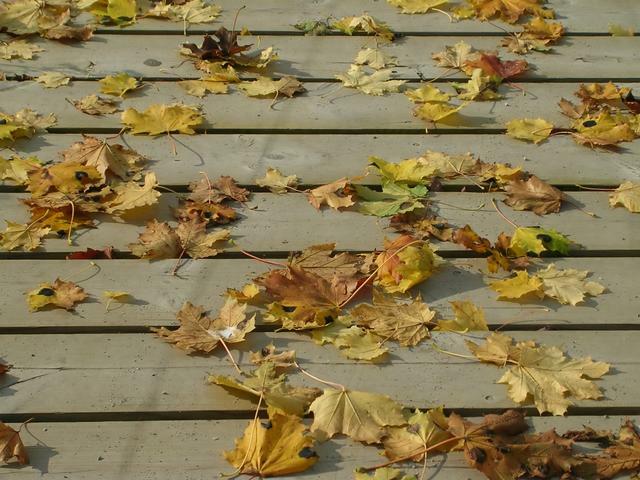 Dont forget to get down on your knees and knock out all the decaying leaves and other crud that has lodged between the deck boards. Otherwise, this is a breeding ground for rot, mildew,etc. For a in-depth refinish, use a power washer that delivers about 1,200 PSI of blasting power. The idea is not to tattoo the deck surface; start out easy and bump the power up until youre effective yet not damaging. Safety disclaimer  Always use goggles and rubber work boots. Note  If the decking is Trex or some other composite decking material, a pressure washer is not recommended. As you blast the surface, do a section at a time, working with the grain. Overlap the sections to get even cleaning. The power washer treatment should have gotten rid of all or most of the surface discoloration. If some is still apparent, use an acid-based deck restoration product or deck bleach and carefully follow the directions. Some deck owners choose to apply deck paint. My personal response? A resounding Bleah! Its downright ugly. But thats just my opinion. And functionally speaking, this just makes for a surface coat which will chip off and not protect as well. It should contain a mildew-resistant component (mildewcide). Look for superior UV protection. Make sure its waterproof or water repellant. Water resistant just aint the same thing. If you want to add a tint, be sure the finish is a tintable base.